The future lives in 2019 – a 19 part series to kick off the new year exploring products, technology, manufacturing, and how advancements that we may think of as futuristic actually live today in 2019. What are the trends? What are the new exciting products? How are they made? We will take a look at all of these from a market viewpoint and from a rapid manufacturing viewpoint. 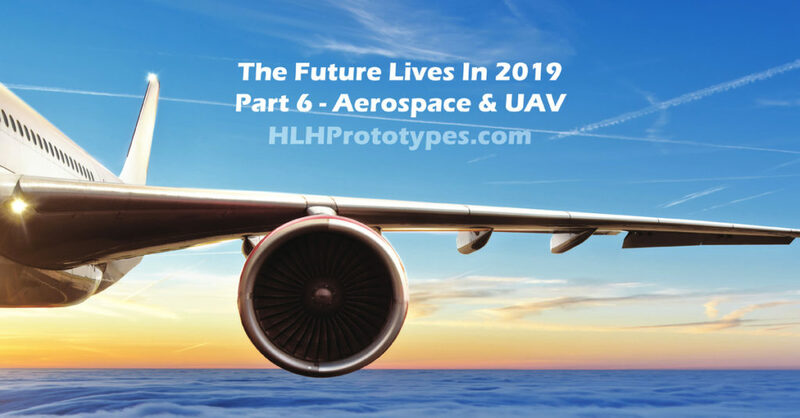 For part 6 we take a look at aerospace and UAV and how additive manufacturing is rapidly becoming a go-to manufacturing choice for both industries. Particularly when it comes to aeroplanes and rockets one would not commonly think of 3D printing as a manufacturing solution for production-grade parts but that is what is happening right now, today. The aerospace industry has been one of the earliest and most comprehensive adopters of additive manufacturing and this trend will intensify in 2019 as we see several new technologies and materials come online. Aerospace manufacturing is experiencing an upsurge especially with the increasing demand for professional and consumer drones and UAVs. This means supply chains are stretched and especially with the ongoing trade war between China and the US, aerospace manufacturers and suppliers are looking to quickly move to digital manufacturing. In the aerospace industry requirements differ widely depending on the business and so 3D printing can be utilised to deliver many different options for many different businesses. Additive manufacturing enables the production of prototypes and low volume test parts for R&D through to production-ready parts. The major advantages for aerospace are the reduction of administration in aerospace R&D, increased complexity and weight reduction for lower costs than traditionally manufactured parts and specialist materials developed specifically for purpose. 3D printing is already delivering tangible manufacturing benefits by reducing material and labour costs, and enabling rapid testing of components, especially critical engine and landing gear parts which might have taken weeks to manufacture conventionally. Outside of additive manufacturing other prototyping capabilities enable aerospace and UAV manufacturers to take advantage of low volume manufacturing to cut costs and offer customers a more personalized or problem-specific solution. Low volume injection molding is a great solution, allowing access to many grades of certified materials and also the process repeatability aerospace regulations demand. Drones and UAVs both consumer and professional are set to take over the skies. The development of tailored solutions for different problems and environments requires flexible design and manufacturing. Prototype manufacturers offer high mix low volume experience and capabilities and a range of application suitable processes to allow for quick fire product development and low volume manufacturing. Below are 3 examples showing that 3D printed parts in the aerospace industry are living right now, today, in 2019.